Here’s a spot where I list important links to software and information to help you with computer backup and data recovery. I’ll help support your efforts with these products as I utilize them in my consulting practice on a regular basis. This page is dedicated primarily to single user PC backup solutions as well as small peer network solutions. If you are interested in a larger network or server backup solution please contact me for a custom recommendation for your system. PLEASE NOTE: Please be advised that ASKAVIE, LLC has an affiliate relationship with the Vendors represented on this boutique page and is paid a commission on each verified sale initiated via the banner links on this website. Acronis True Image Home 2019 is my goto program of choice when it comes to a complete backup solution. I use this product to do Full-Image Backups meaning every bit of data including Operating System, Programs, Data Files, EVERYTHING gets copied so that it can be restored from scratch to a brand new Hard Drive without missing a beat. Of course, individual files, folders, etc can also be restored from this image making it a complete solution even for those times where you simply need to recover a deleted file. Schedule the backups, run them continuously, or manually perform them – to any media you choose. And now, for 2019 – all of these features are available to Cloud storage that complements the original local backup with the redundancy of a secure off-site cloud backup. It’s simple to install and setup and of course, Your Tech Concierge™ is always here to help you. aSKaVIE’S Clone-Kit™ – designed to produce an exact duplicate of your existing hard drive so that in the event of a crash or other disaster, you simply remove your existing hard drive and install this pre-imaged clone. Restore the data from your most current backup and you’ll be running as normal faster than any other option. Combine Acronis True Image from the link above with the USB SATA Hard Drive Dock by Anker, Sabrent or Thermaltake and pick a Western Digital drive that fits your system either 2.5″ for laptop or 3.5″ for desktop and match the capacity or increase it as needed (up to 4TB with Anker and Sabrent Docks). NOTE: ASKAVIE, LLC has an affiliate relationship with iDrive and is paid a commission on each verified sale initiated via the banner links on this website. Why Choose IDrive Online Backup?  5 GB free for life – larger accounts start at 2 TB cloud storage, plus 2 TB sync space. You can backup unlimited number of devices into one account.  Military Grade Security – using 256-bit AES encryption with an optional private key.  Sub-accounts – create unlimited Sub-accounts, within your storage space and monitor via a central administrator console.  Social Media Backup – backup unlimited Facebook and Instagram photos and videos to a single IDrive account.  Server and database backup – For SQL, Exchange, Hyper-V, SharePoint, Oracle and Linux.  Local Backup – with IDrive Wi-Fi (your own personal encrypted storage device).  IDrive Express – Quick backup via physical shipment, up to 3TB. The service is free 3X a year for business users.  Business Compliance – assistance to comply with regulations like HIPAA, SOX, GLBA and SEC/NASD. Support and App for Synology NAS Backup. NOTE: ASKAVIE, LLC has an affiliate relationship with Cloudberry Backup and is paid a commission on each verified sale initiated via the banner links on this website. NOTE: ASKAVIE, LLC has an affiliate relationship with Handy Backup and is paid a commission on each verified sale initiated via the banner links on this website. 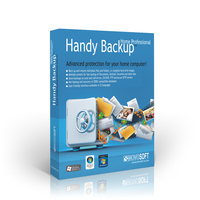 Handy Backup™ solution – is an automatic backup and recovery software for any home PC or business server. Native Backup Format -View, modify or restore even one file of your backups with traditional file-browsing tools like Explorer, without a need of a full restoration! Unified GUI – Back up your files, folders, databases, websites, cloud accounts or app data, using the single, simple interface for all tasks! Different Backup Methods – Take full, incremental, differential or mixed backups, synchronize data, make versions of dataset data – back up as you want to! NOTE: ASKAVIE, LLC has an affiliate relationship with Laplink and is paid a commission on each verified sale initiated via the banner links on this website. NOTE: ASKAVIE, LLC has an affiliate relationship with Dashlane and is paid a commission on each verified referral/sale initiated via the banner links on this website. Dashlane is an innovative, modern, secure storage, creation and management tool for your passwords. Dashlane creates, automatically changes, and stores in a digital wallet, encrypted versions of your passwords and allows automatic, secure login access to your respective websites. Dashlane works on PC’s, Macs, Tablets, iOS and Android Phones. Download a Free copy that supports one device or Purchase a Premium Account (recommended) that will add priority e-mail support, will synchronize and backup your passwords and wallet on unlimited authorized devices, plus add secure web-access to your backed-up encrypted passwords, for an annual subscription fee of $39.99/yr. Roboform for years, has been my recommended choice for secure storage and management of your passwords and notes. It also includes a form filler. Roboform Everywhere stores encrypted versions of your passwords and synchronizes them to all of your devices. This includes PC’s, Macs, Tablets, Phones, and encrypted access via the Web too. Download a Trial copy or Purchase an Annual License that covers all of your devices for an annual subscription – first year is just $9.95 and subsequent years is $19.95. Local (non-cloud) versions are also available. Goodsync is a nice program when you simply wish to update your data backups that you perform on a daily basis. This is a fast way to “synchronize” data from one source to another -say a backup flash drive, cloud based drive, or an external hard drive. Rather than copy EVERYTHING from source to target, Goodsync manages to identify just the bits that have changed in your files and copies those – making it very efficient and much faster than a full or incremental backup. Off-Site Backup is important to a well-rounded Disaster Recovery Plan. The SOS On-Line Backup Service offers rock-solid backup with unlimited versions stored. Take a look at the plans and pick the one best for your needs. Business solutions are effective for Servers and HIPAA compliant plans are available. CompanionLink will synchronize your PC data to your Phone and Tablet. Companionlink specializes in Contact, Calendar, Task and Memo sync. Need to sync your Outlook Calendar with your Google Calendar? Have a specialized CRM application and wish to sync it with another software product?